Mumbai is home to some really rare cars, including the likes of Ambani’s Bentley Bentayga. Hence, it’s pretty common for Mumbaikars to see some rare and exotic metal cruising down the streets of this city. However, as you can see in the video below, the traffic cops were pretty surprised to see a rather unusual car on the streets of Mumbai. 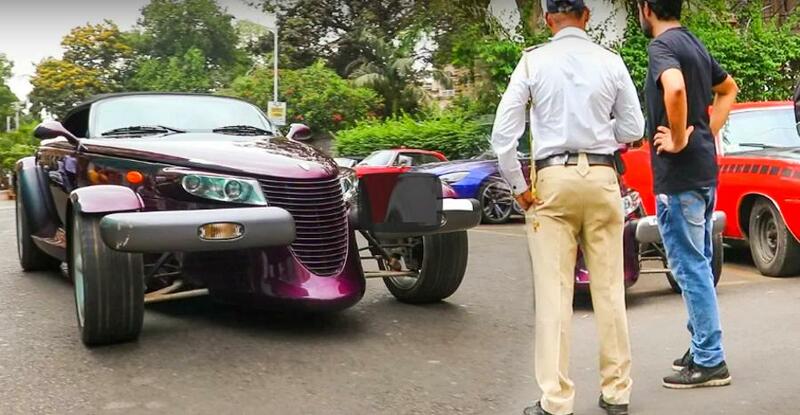 The car in question here is a violet-coloured Plymouth Prowler that was part of a recent car meet in the financial capital of the country. As can be seen in the video we have below, the traffic cops in Mumbai seem to love the way this car looks. The Plymouth Prowler was manufactured in the United States of America and was on sale till 2002. Basically, it’s a retro-styled car that was first launched in 1997 by Daimler-Chrysler. While the design of this car paid homage to some of the hot-rods of the bygone era, it came with a modern 24-valve, 3.5-litre V6 engine that offered 214 bhp at 5,850 rpm. Later, this engine was replaced with a more powerful, aluminium-block unit that produced 253 bhp at 6,400 rpm. Both the engines were mated to a four-speed semi-automatic transmission. This transmission was positioned at the rear of the vehicle and was joined to the engine by a torque tube that rotated at engine speed. This is an arrangement that is used even in some more powerful cars like the Chevrolet C5 Corvette. It helps to facilitate a 50-50 weight distribution. It’s said that the design team at Chrysler was given a totally free rein to design a modern-day hot rod. Thomas C. Gale, Chrysler’s design director, took inspiration from some hot-rods of the 1930s. The Prowler can be said to be a modern-day interpretation of those classic hot-rods. It’s also said that some of the inspiration came from drawings of a retro-roadster by Chip Foose, the star of reality TV series Overhaulin’. We feel that one of the most striking design elements of this car is those Indy racer-like front wheels. Prowler’s body was produced in Ohio and the car was hand-assembled at the Conner Avenue Assembly Plant in Detroit.